I wouldn't say I'm scared of clowns (obviously: I'm not scared of anything), but I definitely don't go out of my way to seek them out, which is why I probably won't be playing point-and-click adventure Dropsy, out now. I did, however, watch the launch trailer, because I can't resist a sing-a-long. To be fair, the way the game is described I don't think Dropsy was actually responsible for the fire, but it is an uncomfortable premise. As Andy said in his preview, one of the main themes is about loving the unlovable, i.e. this mute clown that people think is a murderer. 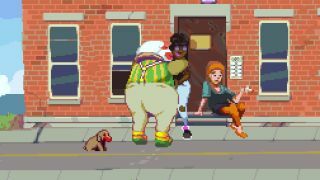 Dropsy just wants to make friends, which I guess is why he goes around hugging people, but then according to the song his embrace is "warm and damp" (which may have something to do with why he's called "dropsy", an old-fashioned term for oedema) so rather them than me. If you don't have a problem with clowns, then it does look like an interesting game with a different kind of story than we're used to. I like the way characters speak in pictures from which you draw your own interpretations. He also seems to have a puppy in several of these screenshots, so dog fans might also want to take a look. Dropsy is available on Steam now for £6.29.